Don't worry. I'm also reading this, and I agree – it's pretty hokey. But I think it's interesting nonetheless. If the above is true, an offhand remark set the wheels in motion for the organization of the Pacific Crest Trail. According to Barney Mann, the conversation took place in this building, the Old Main Building at Western Washington University, which was a teacher's college when Miss Montgomery worked there. Unlike the organization of the AT, The PCT has no visionary like Benton MacKaye, a man who dreamed of a series of hotel getaways providing escape for overworked cogs of the capitalistic machine he thought America would become. Nor is there Myron H. Avery, the man who worked much harder to make the AT a reality than MacKaye could ever claim. Even so, the PCT exists. Which makes me wonder – why did the PCT work? If it wasn't the love child of a single individual and instead the work of many – why did the idea resound among so many and actually get done? What was the mindset of the people back in 1926? And what were they trying to do when they decided to actually create the PCT? In this piece, I have no plans on covering the history of the PCT. Others have logged the efforts of the past in much more detail than I ever could. If you are interested in that, names and dates can be found elsewhere. Instead, I want to explore the PCT story as a cultural undertaking, a great achievement put in piecemeal by hiking clubs, dedicated individuals and a society concerned with conservation. And though Miss Montgomery is important because of her legacy, her seed of an idea could only grow because it was strewn in the right place – The American West, 1920s – among a people dedicated to preservation. The story of the PCT is their story. To understand the PCT, I think it's necessary to understand the idea behind the American West. And for that, we're going to need a little history. The first Europeans to find California were the Spanish, who took up residence mostly because no one else really wanted it. Other powers were busy settling other areas, and the few towns set up by the Spanish were mostly missionaries set out to “educate” the local Native American tribes and a few trading ports to help Spanish ships heading to Asia. Eventually, both Great Britain and Russia would show up and stake a flag here or there, but the overall population remained sparse. Spain eventually stopped caring too much about California because their power in the European continent was shrinking. The United States entered the picture by 1840. Soon after, Mexico signed a treaty with the U.S. ceding major lands, including the Sierra Nevadas over to the U.S. The Feb. 2 treaty was amazing timing for the United States; a week earlier in 1848, James Marshall found gold at Sutter's Mill sparking the California Gold Rush. From 1848 to 1868, the population of California grew from 10,000 to 500,000. And that's ignoring Native Americans, who lost 100,000 in that same time period. The West Coast began its strange story of uninhibited growth for the next 150 years. Industry after industry found a foothold in California. Agriculture, oil, natural gas – all three exploded over three decades. And then at the turn of the century, Hollywood became a household name. Apparently, the proximity of multiple habitats and almost constant sunny weather made it really easy for producers to schedule shoots and find appropriate backdrops. By the time Miss Montgomery was talking to Joe, aerospace industries set up shop just in time for the world wars. My point is: the west coast, since 1848 and onward, has grown at an exponential rate practically from zero. There is no such thing as slow growth out there. And today, if you were to chip California off the U.S. Map, it would be the sixth largest economy in the world jumping just over France. And while the west coast population grew exponentially and natural resources continued to be used up, another group began to fight back: the conservationists. Conservationist ideas began to take hold of the American consciousness starting with one the America's first true philosophers, Ralph Waldo Emerson. A scholar from New England, Emerson began to play with the idea of man's relationship with nature as he first began to outline a new movement: transcendentalism. He pondered ideas of solitude and of God. He wrote how society can corrupt an individual's worth. As America's populace continued to reach west, his ideas rung out. When news of the great mountain ranges and extensive prairies bounced around the more civilized states, so too did Emerson's thoughts. Henry David Thoreau's Walden followed soon after, published during California's first boom. Admittedly, Emerson was kind of a 19th century hippy. He used this metaphor to talk about his relationship with nature. "I become a transparent eye-ball; I am nothing; I see all; the currents of the Universal Being circulate through me; I am part or particle of God." Consider that as thousands of people were mining the Sierra Nevadas, both Thoreau's and Emerson's works were infecting those living out west – individuals spending their days not in large cities but in new mining camps just a few years old. And eventually, by the turn of the late 19th century, the seeds of transcendentalism blossomed into a major political platform. Conservation (and its more liberal buddy, preservationism) became part of the national debate. Soon after, Americans elected a conservationist to the White House. Before Miss Montgomery wanted to know about textbooks, President Theodore Roosevelt was setting up the necessary tools for the PCT. Roosevelt created the United States Forest Service, established multiple National Parks and, by the time he left office, designated approx. 230,000,000 acres to be under public protection. That's not to say Roosevelt did everything by himself, but he definitely rode the wave of conservationism during the early 1900s. In other words, he utilized the ideas of the time. At the turn of the century, nature didn't live outside city limits. America's greatest thinkers pondered it. America's citizens lived among it. Cities didn't reign over the landscape. Heck, the great vistas of America had only been discovered just two generations ago. Mt. Rushmore didn't even exist. Back in 1901, the world still had space. Consider what that can do for the standard American's psyche. Space gives someone room to breathe, to create, to discover, to blaze a new path, to see something that no one had seen before. If you don't like your position in life...then go find a new one beyond the horizon. And even more shocking – the leader of the country encouraged this exploratory lifestyle simply because he lived it himself. He breathed the ideal. Roosevelt even met with John Muir, which has to be my favorite story out of all this...and I think it's relevant to my point. John Muir, as a young man, felt the need to explore the world, which he did. Eventually, he ended up wandering throughout the Sierra Nevadas and became something of a philosopher celebrity – growing this fantastic beard, hauling around Emerson and reading to himself under the stars. 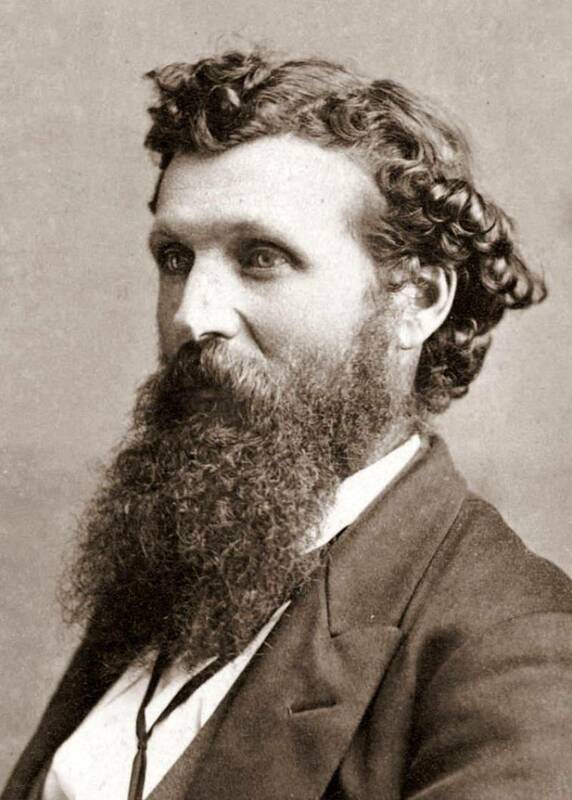 If John Muir sounds familiar, his main claim to fame is that he founded the Sierra Club. He was also known as the leading preservationist during the height of the conservation debate. Well, Muir decided that he wanted to make sure Yosemite became a national park, so he invited ole' Theo out for a romp in 1903. The two met in California and took a train and coach to check out Yosemite. By the time they arrived, Theo was very interested, and he asked for the grand tour of the Yosemite backwoods. Muir said, “love to.” The two headed out (probably with a few secret service) and spent the night under the stars near Glacier Point. By 1906, Yosemite became a national park. Glacier Point, Yosemite National Park. Great place to take a presidential first date. I don't even want to consider how John Muir would be received today. But in 1903, he could ask the president to go backpacking. I may have meandered quite a bit throughout this whole article, but each point was by design (I swear.) What I'm trying to get at – that despite ridiculous growth, despite industry, despite new technology all coming together in this short amount of time, the ground work of the PCT thrived, and it thrived because there was a belief – not a belief held by a select few, but a belief held by frontiersmen, explorers, philosophers, statesmen, bureaucrats, teachers and even the president – that the wild landscapes of America needed to be conserved because the lessons learned out there, out in the wilderness, needed to be available for future generations. In the beginning, Miss Montgomery had an idea. And after six years of concerted efforts by a number of hiking clubs located along the west coast to organize this idea into something a little more practical, the admitted “father of the PCT” Clinton C. Clarke was proposing to the federal government that it should set some land aside. Eventually, it worked. Of course, in the 30 years before the initial proposal of the PCT and the National Trails System Act in 1968, there were lots of bureaucratic battles, cartographic efforts (including four years of one man forcing bands of teenagers to get lost in the mountains) and fundraisers. But it still worked. As for Miss Montgomery, she never saw her efforts come to fruition. She died long before the PCT proper was “officially” finished in 1994. But if you take a look at her, I swear I've seen her face before. The attire may be different, but I've seen those sparkling eyes before. And as sure as there are dreamers, I know I will again. During my Appalachian Trail hike in 2012, I kept a blog. Today, I mapped out my old posts. Read from Day 0 to Day 146, and witness the journey that worked as the catalyst for this long-hike madness. Between A to B's host, Josh Ellerbrock, tries to give an answer to the question he is asked the most: "Why are you hiking the PCT?" The answer devolves into a quick examination of his past. I don't have time or the equipment to film an entire documentary about this podcast. So...I did the next best thing; I made a movie poster. Admittedly, this thing took a lot longer than I had hoped (mostly because I wanted to make sure it looked extra ridiculous). By the way, my dog Captain is taking the place of Darth Vader, but he is not going on the trail with me. If you're starring at your computer screen in confusion, this might clear it up. ...Sometimes, I wonder what's wrong with me, too. With the start of my Pacific Crest Trail hike looming closer, this minicast covers how "Between A to B" podcasts will be structured and gives summaries of each upcoming episode. Facebook page link found HERE. A 22-hour car ride across the country brings out the "weird" in our host as he begins the next phase in his journey to hike the Pacific Crest Trail. Note: "Between A to B" Kickstarter mentioned in episode can be found HERE. In this minicast, the physical challenge of hiking the Pacific Crest Trail is explored through an interview with a physical therapist who happens to be the host's sister. Josh: Welcome to another episode of Before A to B, the prequel to my upcoming travel podcast series called “Between A to B” to be released as I walk the 2,000+ miles of the Pacific Crest Trail. If you like what you hear, if you could share this, like it, tweet it, whatever, spread the word, it would be much appreciated. If you take a listen to this backing track, you should already have an idea of what this episode is about. I recorded this particular clip when I was running earlier this week. The idea is to build up some muscle around the joints through repeated impacts before I head to California, because if I were to describe the trail in only two words, that phrase would be “physically demanding.” So to get a better idea of what my joints, muscles, tendons, etc. etc. might encounter out there, I found a physical therapist to give me a few pointers. To be more specific, I talked to my sister. Angie Huber: Okay. My name is Angie Huber. I'm Josh's sister. I'm a physical therapist and instructor. Josh: Besides that intro, she always wanted me to mention her credentials as a marathon runner and her specialization in total knee replacement. She currently works as a lecturer at the University of Findlay. And basically we reviewed, toe to head, the body parts that receive the most stress during a hike of this size. Also in this episode, I put together a short clip that explains why I think sound and hiking form a perfect pairing. So, let's jump in. Feet first. Get it? Feet...feet first? It'll make sense in a second. Angie Huber: Well, umm, when you look into hiking you got to realize that your weight bearing not just your normal body weight, but you're carrying a backpack, so a lot of injuries can occur, when hiking, in the feet. You can get paresthesias, because you have that extra weight. Josh: Quick footnote: Parathesias are the medical term for when something falls asleep, like that prickling sensation. Hikers tend to get parathesias in their toes when their foot gear fits incorrectly, or they tie their shoes too tight. Angie Huber: And then usually, you're also getting used to a new pair of shoes on different terrain, so the foot is constantly getting more pressure than it's used to. The feet change in the sense they do get stronger. And then depending on the person's actual foot type, whether they are a pronate or supinate, it just means a flat foot or high arch foot, that's going to lead them to different types of injuries depending on their shoe wear and the how strong the inside muscles of their feet are. Josh: What about the skin of your feet? Angie Huber: Yeah, that actually is one of the biggest things that hikers need to think about before they go out for long hikes. When you look at the amount of compression you are putting on the feet, and then you're adding in flooding, you're getting a lot of moisture to the foot, you tend to get blisters on the feet. So prior to going out for a hike you need to make sure your shoes are fitting correctly and when you aren't, you need to let them air out. When you have moisture, you tend to get more blisters. So hiker feet, they can get a lot of damage to them, if you're not taking care of your feet. Angie Huber: Oh yeah, ankles take a beating on hiking because the surface is uneven all the time. So, um, one of the biggest things is spraining your ankle, so that's just twisting it, if you land on it wrong and twist it. You know, someone that's not on a mission of hiking everyday would probably sit down and let that ankle have a rest for a day or so, but that might not happen so much when you're in the middle of a hike. So ankles can get a lot of sprains and irritation from that. Um, the other things with the ankles is there is a lot of tendons, which is a basic part of the muscle, it just gets overused because of so much repetition. So you've probably heard of Achilles problems, um, there's other tendons other than the Achilles that can also be irritated around the ankle joints. But mostly from the feet, you're going to have the spraining problem, and you're going to have overuse on those tendons really cause a lot of pain. Angie Huber: Yeah, knees do get a lot of strain with hiking. One of the biggest things with uphill hiking is the kneecap, so there's something, a big word is chondromalacia patellae, but basically, it's just irritation to the back of the kneecap because of the angle of your hiking when you go up. When you go uphill, there's a lot of compression on the back of the kneecap, and yeah, it can definitely get aggravated. Anybody who has already meniscus-type issues in their history, which is a cushion basically between the knee joint, they tend to have some problems with more of that uphill power. But then the downhill becomes more of an issue, because you lose, the big term is proprioception, but after you've gone downhill awhile, basically, your knees get a little wobbly, and your sense of placement on the ground becomes less. So your risk for any kind of overuse injury becomes higher after doing a downhill. So, one of my suggestions would be if you just had a long downhill hike, take a break before you go on. That might be your break time versus the uphill because your knee caps really become weak and unstable from doing downhill hiking. Yeah, overuse injuries from the tendons, knee caps becoming irritated and any arthritic changes in just over-compression can occur in hiking. Angie Huber: Wear and tear from hips for hikers specifically, you're going to get a lot of, basically, tendon irritation or your overuse injuries. The other big one that can be a problem goes back to the uphill, if you're doing a lot of uphill hiking, there's this band, have you ever heard of IT (iliotibial) band problems? That band can really rub along the side of the hip, and cause some inflammation and swelling and (audio untranslatable), what we call bursitis, which is just swelling along the side of the hips. So that can be a big problem, and that can be more of an overuse issue as you keep going. If that doesn't necessarily heal, that can really limit walking. Other problems... there's a lot of internal problems of the hips that can get aggravated with hiking, but to actually have a true injury while you're hiking probably is less likely in the hip. It's going to be more overuse problems. Angie Huber: Back takes a hit with the backpack. Now I'm sure you'd be much more knowledgeable about getting the right backpack and putting it on right, taking that load off the back, but no matter how well you're backpack is or how much appropriation to make it fit right, you're still getting that much more compression on your disks and your spine. So your back can get really sore. You're carrying a backpack all day and then you have to sleep on the ground. Some people's backs don't like that so much. Most people who have back pain and back problems do better with a firmer bed, but even a firm bed will cushion you some and disperse the pressure of your weight. Josh: Finally, I want to talk about ears. Recently, I've had a few individuals ask me 'why am I doing a podcast?' That's a great question. I'm glad I can answer it. First, to better make my point, we're going to make a quick scene change here. Okay, bam. Hiking. That's what we're doing. So, those last three seconds that we just experienced, now that time, is 90 percent of the moments that comprise a thru-hike. Vistas are great. The people you meet along the way are exciting. You never really know what's around the corner. But throughout it all, you have this. Step. Step. Step. Now, the experience of a (Step.) trail hike, it's rarely visual. (Step.) Okay, you have miles of (Step.) forest and scrub and desert. (Step.) Hundreds of miles (Step.) of nothing, of blue sky (Step.) and brown sand. They (Step.) lose their novelty (Step.) pretty quickly. As for vistas, (Step.) those life changing (Step.) views you hear so much (Step.) about. They become (Step.) just another image. (Step.) They mean nothing. You've (Step.) seen them before. (Step.) You'll see them again (Step.) a few miles down the road. (Step.) And the miles in between, (Step.) they barely even register. Alright everybody, (Step.) thanks for listening. (Step.) Join us next week (Step.) for another episode. The second episode of Before A to B features the host's mother talking about the challenges of knowing her son sleeps in a tent surrounded by potential dangers. Josh: Hi, folks. This is your host, Josh Ellerbrock, and welcome to another episode of “Before A to B”, a set of weekly minicasts setting up my upcoming travel podcast series called “Between A to B,” to be released during my Pacific Crest Trail hike. First official episode of “Between A to B” comes out April 16. (Note: The release date of “Between A to B” has been moved up one day to April 17.) Let's get started. Every man has a mother. And if she's anything like mine, she's pretty cool. In my family, she acts as the glue between all of us. And she's raised four children to be a group of mostly adjusted adults – a rarity in this day and age. Her name is Martha, by the way. Now due to my tendency to seek adventure, she's accepted the added responsibility of having to explain my travels to her fellow residents of small-town America. Many who don't see much purpose in venturing outside county lines. As for my relation with her, I like to think it's a good one. We may not talk every day but when we do, the conversations go long. She's also the one person I could better explain the trail experience to. Now I could talk for hours about the “why” behind thru-hiking, ad by the time I'm done with this project, I will have. But before I do, I wanted to get a better understanding of the window that others view this adventure through. And so, I talked to my mother. Turns out, she's trying to understand this thing too, in her own small way. Mother: Dad and I plan on doing that with his sister, Laura, and her husband in 2018. We have a date set. We want to take an easy part of the Appalachian Trail and just go one week. Mother: And we really want to do it. And we want to kind of prepare for it. You know, make sure we walk and get physically, you know, more set for it so we can walk 10 hours a day. Josh: Yeah. What were you thinking? Shenandoahs, basically? Mother: Yeah, we were gonna, wherever you had suggested since you've been there. And take on the trail that way, you know, the parts that you would suggest that would have a lot of beauty to it and not too hard of a trail. It'll be interesting. I don't know what we'll do, how far we'd go, that's not it. Basically, have a different experience, something we've never did before. I get you when you want to get away from the basics of life, sometimes. The stupid stuff that hits you and smacks you everyday. Sometimes, I want to throw them out too. It's like, come on. You know. I'm not saying I don't have any questions about it. I mean, if you want me to be truthful, but...um, I'm totally supportive. Josh: What are some of your doubts? Because I know you have some. Mother: Your safety. Your health, I guess. Um...I'm apprehensive about that. Um. Not enough that I don't want you to do it. If you would say 'Okay, mom. Tell me right now. Should I do it? Or should I not do it?' I would say 'Do it.' You know, it's not so much that I don't think, when I become apprehensive about it, it's not because of you doing it, because anything you tackled and really wanted to do, you've accomplished. It's more, it's not about me. It's, you know, what my children do, it's not about me. It's what you need to do, and that's why I support it. You know, and I think...I think it's awesome that somebody has the drive to do that. Because I'm not that kind of person that has that drive. You know, it kind of makes me jealous sometimes, you know, that I don't have that. I would have fears of what's out there somewhat. I think a little bit. I would have to feel comfortable when I went to bed. You know, if I had any worries about where I was at or my surroundings. That would make a difference. But if I was with people, if I was sleeping alone I'd have more. I don't like being alone. So, that's not a good thing, but if I was with group of people with other people around me, that would make a difference. Josh: What would stop you from sleeping well? Mother: Ummmm....Strange noises, I guess. Animals. Um...animals and discomfort might stop me from sleeping well. How much pain I have from the day. Aches and pains, you know, especially if I wasn't in shape. There's a lot of thing that it's better I don't know, but I know how that is. I didn't tell my mom everything. (laughter) Some of the things I told her after I was 40 that I'd done, she'd say 'Oh, my goodness!' (laughter) but you know, you know how that is. People say to me, 'How can you stand that? You don't know where he's at. That would drive me crazy' and I'm like 'No...' And I think because you did the Appalachian Trail, having done that already, and I had that book. And I felt like I was walking with you, in a way. Josh: Quick aside: The book she is talking about here is “The A.T. Guide” by David “AWOL” Miller. Most AT thru-hikers use it. Mother: ...That part didn't bother me after I had bought the same book that you had. And when I would talk to you, I would guess through my mind that 'I bet that he's at that shelter'. And 90 percent of the time you were at where I thought you would be. So that part didn't bother me as it did in the past. But I do not like that you're gone for six months. You know, any mother's dream is that her child is there. But, you know, that's not going to stop me from letting you do what you want to do.